What would you do if a massive Australian spider was hiding in your removals container? An Australian spider, almost the size of a guinea pig, left the removal men scared when it turned up in Surrey. 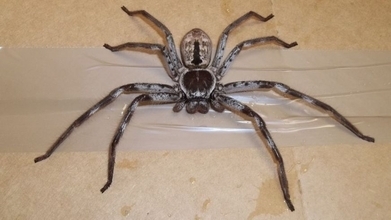 The 18cm huntsman spider was found in a shipping container after travelling 10,000 miles over a period of three months! Fortunately, the spider was non-venomous and did not harm any of the removal men. The giant huntsman variety can grow to up to 30cm in leg span. From the empty locust shells found with the spider in the container, it’s clear that he thankfully had been able to find some food during that time and he is also very lucky that he did not get squished by any boxes or furniture! So.. some of you may find spiders and other creepy crawlies cute but would you want them anywhere near your personal belongings when you’re moving? We think NOT. The best way to ensure that your container is free from any unwanted suprises is to choose PSS International Removals as your first choice for shipping overseas! PSS International Removals are specialists in shipping international removals and excess baggage and have been doing so for over 31 years. Give them a call today on 020 3053 9200.